One thing that I really love about homeschooling is the opportunity to teach to mastery. It is a benefit that both of my kids need but neither would likely get in a typical classroom. In some areas, this allows them to move forward quicker and in others, it allows them to linger until the concepts sink in. One area that we tend to linger is math. If the concepts are not mastered before moving forward, trouble will be down the road. One of my children raced ahead in math in the earlier years, but hit a wall once we headed into middle school territory. Some of this was developmental, but not truly mastering and understanding the steps learned previously was a contribution. For this reason, we've been spiraling in this subject for about three years, filling in holes, adding more practice problems, and drilling facts before moving on to the next level of material. My aim is to help parents and teachers teach math so our children and students can really understand what is going on. I've strived to explain the concepts so that both the teacher and the student can "get it" by reading the explanations in the books. In essence, the books become practically self-teaching. I had the pleasure of reviewing Math Mammoth last year. Please do read the full review from last year as I used different workbooks during the review period and included additional information. However, for those new to Math Mammoth, the following is a repeat of the product lines available from Math Mammoth. Math Mammoth has a full line of products for grades 1-12 to fill just about any need, whether it be a full curriculum, supplemental, or remedial resources. These downloadable workbooks are perfect when an area that needs more attention - right now - is discovered. There are several different series and collections available. Each worktext, containing both explanations and problems, in this series concentrates on only a few topics with varied problems for full understanding. The focus is on learning a particular topic; some of the books in this series cover several grade levels of material. This series is an excellent choice for remedial or supplemental work. Depending on the selected topic, cost for an ebook format is a very affordable $2-5. The Lightblue Series is a complete curriculum. The two worktexts (A & B) include answer keys, tests, cumulative reviews and an additional worksheet maker. Each grade level has limited topics, going deep rather than broad, and a longer time is spent on one topic for better learning. There is little prep work for the teacher. Children who can read will be able to self-teach with the clear explanations, including visual and puzzle exercises. The Blue and Lightblue series are essentially the same material, just organized and packaged differently. Each downloadable worktext is available for $15.50, or you can purchase both A & B worktexts for $29.70. This series is a collection of 120-150 worksheets for each grade for review and supplementation, starting with grade 3 and going through Algebra 1. The Golden series has problems only; concept explanations are not included. One topic per page is covered with variable problems for practice and understanding. Grade levels are available in two parts (A & B) with their corresponding answer keys available separately. Each part (A or B) is available for $6-9 and answer keys for $2. Complete packages are available for $12-14. This series is similar to the Blue Series in structure and is organized by the topic. The worksheet collections may span several grades, making this series great for a comprehensive review and supplement of a particular topic. One topic per page is presented with variable problems, including word problems. The worksheets in this series are the same as those in the Golden Series, just arranged by topic rather than grade. Prices range from $2.50-9. This series has been added since my last review. Do you have a grumbling student because they don't see the purpose of math? 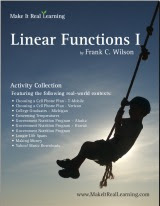 This series, written by Frank Wilson, provides real life application of the math concepts your student is learning. The problem sets are meant for short usage, ideal for 1-2 class periods. If you have a high schooler or student that has covered material in the other series, look in this series for upper level material. Prices range from $4.99 individually or for $39.99 for the complete set. Each series is also available in printed format, CD and in various packages and pricing structures. Purchase of certain packages also includes bonus Soft-Pac software. If you are unsure of what grade level you need, Maria Miller is willing to consult parents on what might be a good option for your child. There are also placement tests available for the Lightblue series. This time around I selected Algebra 1 Worksheets from the Golden Series and Linear Functions I from the Make It Real Series. The biggest thing to note with this particular series is that there are no explanations on how to do the problems. For us, that worked out perfectly because I am using this workbook as supplemental work to make sure the material is solidified. My daughter has no trouble following directions and solving a problem with examples for reference. However, after she has learned the new material, I want her to be able to understand the material well enough to apply it without explanation. Because one topic is covered per page with a variety of problems, this workbook has been a handy tool for practicing and checking understanding of new concepts. This workbook is perfect for showing your Algebra student real-life examples of how they would use the math they are learning today. There are 10 scenarios with 6 questions to solve. Completely worked out solutions are provide. The first problem set my daughter worked out was titled "Choosing a Cell Phone Plan - T-Mobile". The series uses real situations and real companies to draw in more interest from the student. The cell phone plan application immediately caught my daughter's attention. It certainly didn't look like her typical worksheet. The workbooks in this series are not long (this one is 46 pages, solutions included), but may be just what your student needs for a change of pace and to see what they are learning really is useful! Overall, Math Mammoth is an affordable and convenient math product. While I used our selections as supplements, please read some of the other Crew reviews to see how the complete curriculum option (the Light Blue Series) worked for other families. Visit the Math Mammoth website for more information and to browse all the available workbooks and series. Make sure to take advantage of the offer for a free package of 280 worksheets and sample pages, an excellent way to try before you buy. Disclaimer: This review was provided as a result in my participation in The Old Schoolhouse Magazine Crew. I received the above product at no cost in exchange for my honest review. I strive to give a balanced overview of each product, detailing my opinion of both pros and cons and how the product worked for my family. What works for one family may not work for another. I encourage you to read reviews of other Crew members and research sufficiently to determine if any product will be a benefit to your homeschool. thanks for this review. I have always wondered about the books. Have not used them myself. But quite a few newbie local homeschooling moms ask for recommendations for math, and now I know to send them to your site here regarding Math Mammoth. Appreciate the review. Hi! Great review! What do you recommend for kindergarten? Thanks! Co-ops? Not for me! Or are they? A Snow Day for Our Homeschool! Dd Lets Her Hair Down!